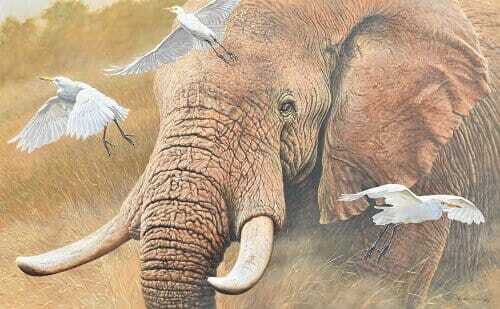 Alan M Hunt is widely regarded as one of the best wildlife artists in the world and although hard to comprehend these images on this website do not portray the actual strength and depth of the original paintings. These original British and African wildlife paintings are truly better than a photograph and Alan manages to capture wildlife art images that photographs never can. 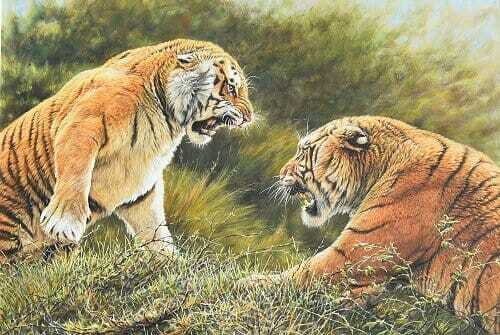 ​Now 70 years old, famous wildlife artist Alan M Hunt has been painting wildlife art for over 50 years. 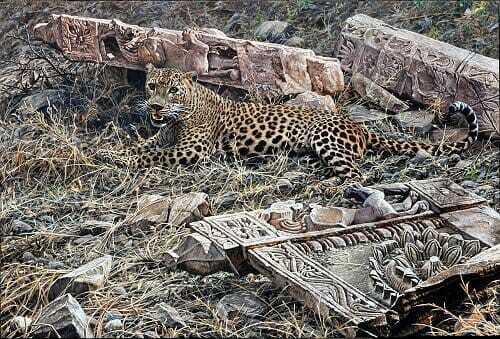 In that time, he has captured thousands of images of animals and birds from around the world and painted hundreds of popular wildlife paintings. Alan M Hunt has travelled extensively on field trips studying wildlife to destinations such as Africa, Alaska, Antarctica, Madagascar and Peru – to name just a few of the amazing places around the world he has visited to study animals and wildlife! Alan is a native of the North of England and now lives in Scarborough, North Yorkshire having previously lived in France, for the past five years, where he enjoyed getting to know the birds of the mid and southern regions of Europe and learning their migratory routes over his own backyard. ​Now back in the UK Alan is enjoying life back in the North of England capturing the local flora, fauna and wildlife. Alan M Hunt's work featured at this years David Shepherd's wildlife artist of the year competition and exhibition where he won 3 awards. 50% of all sales went to supporting and fighting wildlife crime, protecting endangered species and engaging local communities in Africa and Asia. WILDLIFE ARTIST OF THE YEAR ​CATEGORY WINNER IN ANIMAL BEHAVIOUR - THE ARTIST MAGAZINE AWARD WINNER AND THE PEOPLE CHOICE AWARD WINNER. "Beachcombers" - Click on image below to view more bird paintings. A collection of graphite pencil studies of wildlife by Alan M Hunt. 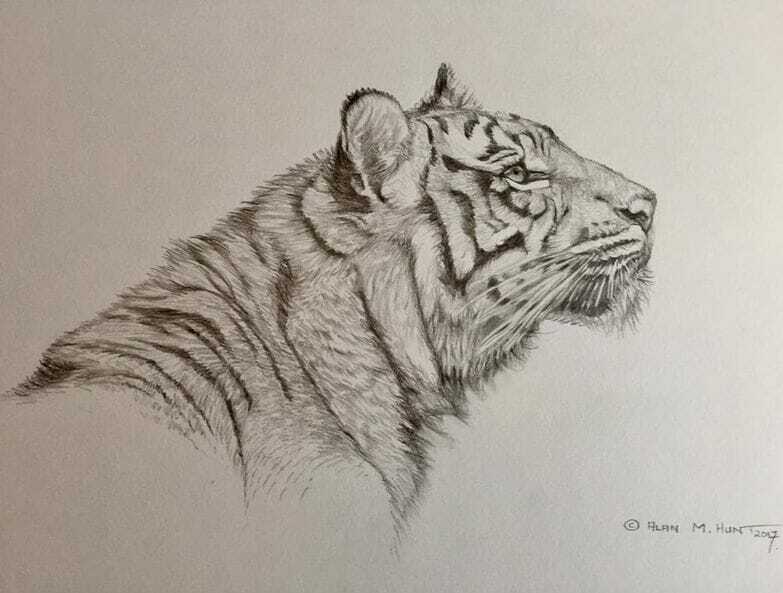 click here to see more wildlife pencil sketches. British Wildlife Artist Alan M Hunt began painting at the age of eight, when his mother gave him a box of paints to occupy him as he recuperated from an illness. He started off painting British garden birds, which had fascinated him from an early age, but soon moved on to capture animals and the natural world around him on canvas. Alan M Hunt firstly studied art at Middlesborough Art College, he then decided to study zoology at Leeds college and Bristol University. His first solo exhibition was in his local town of Redcar and soon after Alan exhibited at the Austin Hayes Gallery in York. Alan has received international acclaim as a wildlife painter for his animal art, winning The Society of Animal Artists’ USA Award of Excellence on four occasions and The Wildlife Art Societies UK "Best Artist on Show" for three consecutive years. ​Alan M Hunt's popularity became immediately evident in the USA and he became the lead artist at five exhibitions in the US and in 1998 was the first non-American painter to be voted on to the American Wildlife Art Hall Of Fame. In 1999, he was chosen as Artist of the Year for the Florida Wildlife Art Expo. Alan’s animal art has become popular and also attracted huge interest at major auctions including Sotheby’s, Bonhams and Christie’s and continues to captivate collectors across the World. And has featured in Exhibitions with the Halcyon Gallery including Harrods in London. In recent years, Alan has stepped away from the media spotlight, art exhibition and gallery circuit to explore and develop his painting style to become the best in his field and with a particular emphasis on capturing texture, depth and richness. His painting experiments have yielded feathers, fur and satin of unparalleled realism. Alan is married to the equestrian artist Judi Kent Pyrah, with whom he has a son, Guy. His step-son Zach Mendelsohn has created an online presence and co-ordinated international art exhibitions for Alan during his time in France. Alan is now back in the UK and currently lives on the Wykeham Estate near Scarborough in North Yorkshire, UK. 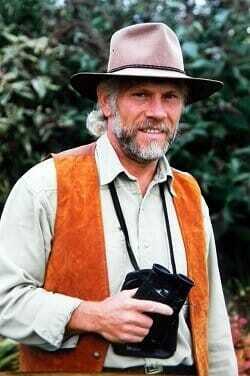 During his painting career, Alan has exhibited his wildlife and animal paintings alongside John Seery-Lester, Robert Bateman, David Shepherd, Carl Brenders, Morten E. Solberg, Raymond Ching, Brian Jarvi, Kim Donaldson, Andrew Ellis, Terry Isaac, Lee Kromschroeder, Steve Winterburn and most of the top and best wildlife artists around the world. Alan judged the Daily Mail's "Not the Turner Prize" painting competition at the Mall Galleries, and the "National Children's Art” Competition also at the Mall Galleries in London. 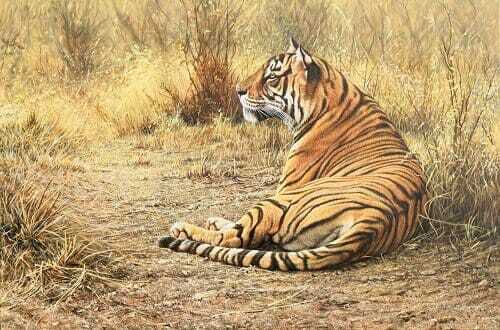 Alan is now semi-retired was section winner in the BBC Wildlife Artist of the Year 2010 with his exquisite tiger painting "The Watchmen" in the animals in their environment section. 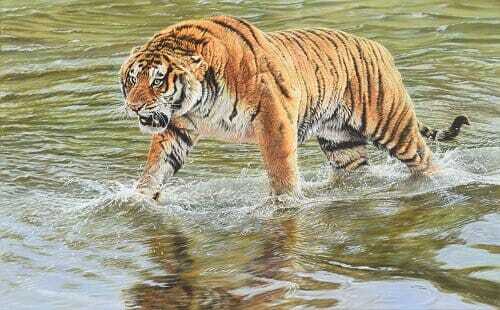 of the BBC wildlife artist of the year competition. More recently Alan won 3 awards at the David Shepherd Wildlife Artist of the Year 2018. These have been the only two art competition he has entered in the last 10 years. Television and Radio Appearances in the UK, USA, Canada, Holland, Kenya, South Africa and Singapore. 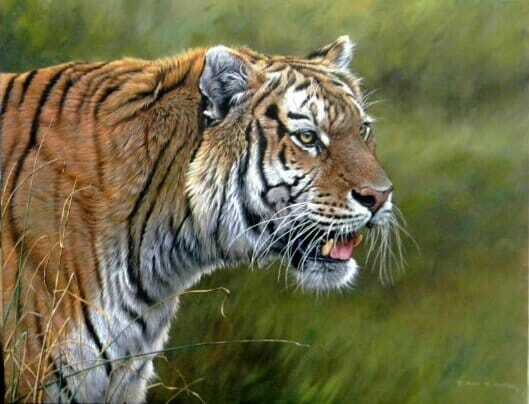 Alan M Hunt is one of the World's best wildlife artist and is famously known for his big cat paintings. His original african wildlife paintings and amazing animal paintings and wildlife art prints adorn the walls of many private collectors and art lovers around the world. Please go to latest originals paintings to see all Alan’s current selection of African paintings for sale and check out his latest wildlife art page. Subscribe to Alan's exclusive email list to be notified of new paintings and artwork before they are released on this website. 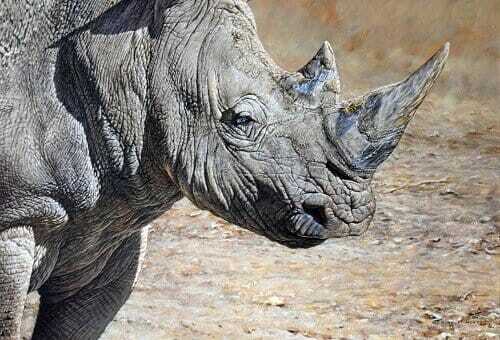 Click here to read more about the wildlife artist Alan M Hunt. ​Please contact Alan if you are interested in purchasing any of Alan's original British wildlife art paintings or art prints from this phenomenal UK artist. See more about wildlife art on wikipedia. 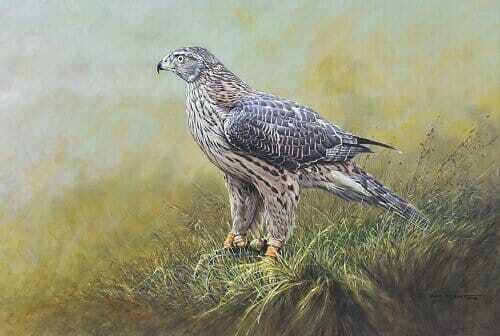 Or alternatively see Alan's wildlife art blog.